This is going to be one of those ‘informative’ kind of posts… I was actually intending to write about something else I made and added to the workshop recently but I appear to be missing some of the in-progress photos of that and, if I did take them then, they must still be on the SD card which is sat out in the workshop right now! 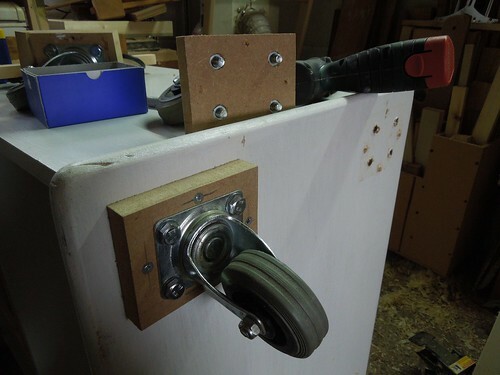 So, this evening’s post concerns some minor modifications I’ve made to the ‘mobility’ of both my table saw’s mobile base and the router table I made back in August. We’ll start with the router table because that’s clearly illustrated in the first photo. My big idea with the initial concept here is that the blocks would allow the unit to sit in place without moving or rolling under any force. That has always worked well. But, it then becomes an issue having to lift and tun the loaded table with half-a-dozen power tools sitting in the lower section! 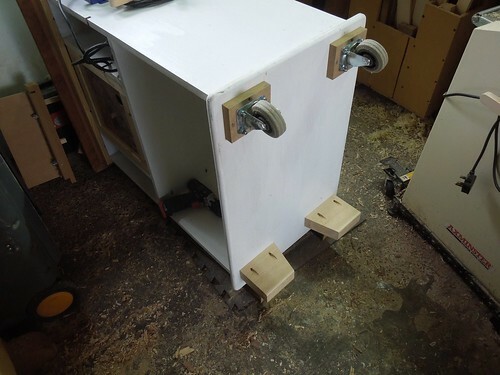 So, I carefully rolled the machine over and on to one end, before removing the blocks and fitting a second pair of swivelling castors (3in diameter with rubber wheels). I could’ve just used locking castors but, where I’ve fitted them in the past, I find that I never actually use the brakes because they’re too small and almost inaccessible for too much of the time. Position them too close to the edge and I find that they can become a obtrusive and even a trip hazard (especially in a compact workshop). Bolt reversal and clearance holes. You’ll notice in that second photo that the bolt threads are protruding too far, which would limit the full swivel capacity of each castors (each bolt is sunk in to the other side of the MDF, with that then screwed on to the underside of the router table). I didn’t bother trimming them off flush as the nylon lock-nuts were still too long. So, I reversed the configuration by embedding the nuts in to the MDF and then threading the bolts through from the castor-side. But still, I didn’t want to reach for my hacksaw (why haven’t I bought an angle grinder yet?!) so, I drilled extra holes in to the base of the router table and that gave them somewhere to rest. Phew! 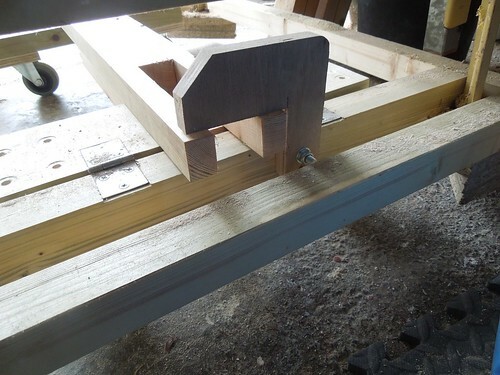 To start off, I needed to increase the height at which the timber frame for the base is raised once the castors have been lowered. Each time I want to use this saw, it is best to wheel it outside but, in doing so, I find that the feet of the base drag and catch on the step down from the concrete floor and on to the driveway. I took some scraps of 18mm thick ply from the bins at work and screwed them to the underside (after unbolting the castors, of course). Adding coach screws with a 10.8v impact driver. 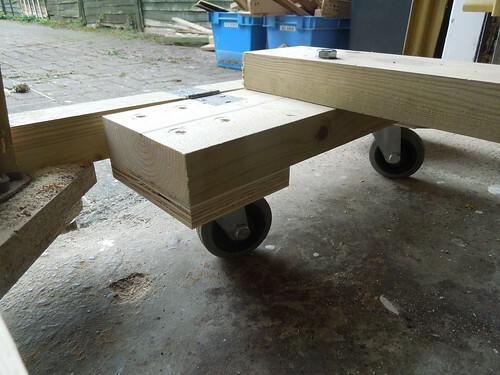 I then reattached each of the four castors using M8 coach screws, threaded through the ply and most of the way in to the thickness of the timber. This has made enough of a difference, even though I didn’t want to risk raising it any higher as that could cause the lift mechanism to foul the tilt of the saw. One final amendment I was hoping to make concerns the ‘flip-lock’ piece of plywood that holds and releases the arm that raises and lowers the saw from and to the floor. 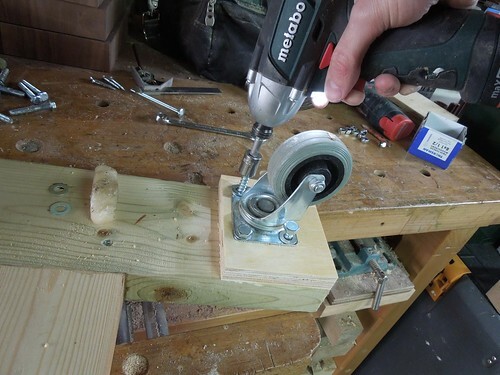 I was looking to add a spring (as in the YouTube video that inspired this) and I even found one that was suitable from an old-but-broken pillar drill guard that was hidden away… But I just could not see a way of attaching that without it otherwise interfering with another moving part. I’d like it (or ‘something’) to be able to pull and hold the plywood ‘over’ the arm, so that there’s no chance of it all springing loose while the saw’s being moved (as you may recall from my own video on this). Each of these simple modifications will go towards improving the mobility issues that often plague a small workshop, such as my own. I’m also helping it will again assist moving the saw once I decided to sell it and find a buyer! That’s high priority at the moment as I would greatly appreciate having a little extra floor space around there again… I still have one project that I’d like to tackle before hand though. I like the post title. 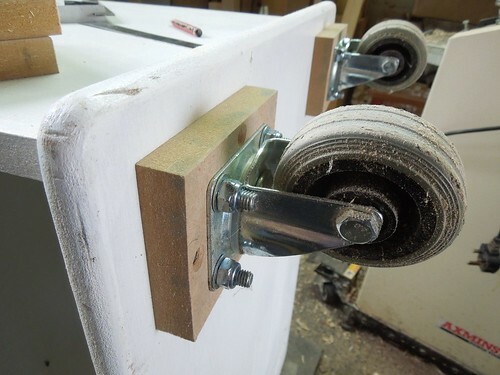 I put casters on my router table and really like the mobility aspect of it. Thanks, Jeff. I find it essential as I’m never quite satisfied with the layout of my workshop and it seems to change slightly every few months. But after visiting my Uncle in London – who told me not to bolt anything down in your workshop… you’ll never think your workshop is large enough!!! So table saw is on order and and that will never stay in one place! Keep up the post’s Olly! Thanks, Steve. It’s good to see you adding mobility to the furniture within your house as well. I’m with you all the way on the workshop front! My ideas initially started because I imagined there would be the odd occasion where I needed to machine something quite long. Me too – bought a DeWalt planer but had to but a portable transformer to power it… But furious that they don’t advertise you need so and ended up taking it back £231 – got my eyes on a Bosch for £80 a lot cheaper! And can’t wait for the table saw, it’s going to be bliss to have a fine edge to my end grain! I’m not selling as well this year and started to produce furniture again! But do live garden furniture! How about you? Any new toys in the work shop? Was that DeWalt planer a 110v model? I can’t think of why else you’d need a transformer, unless it came from the US? But, that would also mean it was 110v. Glad you got yourself sorted with the Bosch though (I don’t own many yellow tools, I must admit). I’ve never really had a need to make any garden furniture but I do appreciate it and how it can be much simpler to construct and therefore more satisfying. No new toys for me. There are a couple of things I would like but there’s nothing I urgently need. I reckon I have three months left before I need to look at moving and selling at least a few items.